Provide comfort for the family of Valentine Wtorkiewicz with a meaningful gesture of sympathy. Valentine M. Wtorkiewicz, 88, of North Huntingdon died Thursday January 24, 2019 at his home. He was born July 30, 1930, in Braddock to the late Anthony and Aralia (Langiewicz) Wtorkiewicz. He is a retired Tool and die maker from Westinghouse-Bettis Atomic Research, Dravosburg. He had five patents registered. He was a member of the St. Agnes Church, North Huntingdon and the Emerald Club; he was also a member of the Knights of Columbus, of Jeannette. 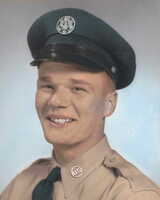 He was a veteran of the Korean War serving in the air Force. In addition to his parents he is preceded in death by sisters Mary Karako and Stella Markowitz. Surviving are his wife of 60 years Edith (Antrilli) Wtorkiewicz; six children Mary Free and her husband, Jerry, of South Greensburg, Dolores “Dee” Patton and her husband, Rick, of New Caney TX, Anthony Wtorkiewicz, of Hutchinson, Valerie McCarthy and her husband, John, of Penn Twp., Theresa Arnold, of Los Angeles, CA, Valentine M. Wtorkiewicz Jr., of Acme; 11 grandchildren; five great grandchildren and several nieces and nephews. Friends will be received 2 to 4 and 6 to 8 p.m. Monday and 8:30 to 10:20 a.m. Tuesday at which time parting prayers will be held in the funeral home followed by a 11 a.m. Mass of Christian Burial celebrated in the St. Agnes Church. Interment will follow in the Penn Lincoln Memorial Park, North Huntingdon. The family suggest in lieu of flowers memorial donations may be made to the St. Jude Children’s Hospital 501 St. Jude Place Memphis TN 38105. To plant a memorial tree in honor of Valentine M. Wtorkiewicz, please visit our Heartfelt Sympathies Store. Donations are being accepted for: St. Jude Children's Hospital. We encourage you to share your most beloved memories of Valentine here, so that the family and other loved ones can always see it. You can upload cherished photographs, or share your favorite stories, and can even comment on those shared by others. Our deepest sympathies to your entire family and friends. Hearts may be broken, but will heal with his unending love and guidance. An angel on your shoulder, he will remain forever. Always in our thoughts and prayers. Gone, but never forgotten. Rest in Peace.